Poverty Is Real - Adam Bowman- Where is he now? As a native of Berwick, PA, Adam Bowman became a resident of Knox County to be alongside his mother, Bonnie Cain, in the summer of 2009. Adam was a participant in the KCEOC WIA Program in August 2009 where he fulfilled his dream of becoming a Professional Jockey. To help fulfill his dream KCEOC assisted Adam in attending The North American Racing Academy in Lexington, KY. KCEOC, along with family and friends, assisted Adam with gas, living expenses, riding equipment, and more. Adam was accepted to The North American Racing Academy after an entrance interview by Hall of Fame Jockey and executive director, Chris McCarron in 2009. Adam, both nervous and exited, jumped at the chance to ride the thoroughbred, and after a rough start, he was accepted. While there, Adam was given the opportunity to ride during the opening ceremony at the World Equestrian Games. Adam described the experience as a “once in a lifetime thing.” Adam was also given recognition as he was featured in the online Wall Street Journal. Adam was quickly stunned as Chris McCarron stated Adam is a “working son of a gun and he wants it bad.” That shows in Adam’s everyday determination to make it in the working world. While attending the Academy Adam had many successes, and reached many goals. The training assisted Adam in his success to be where he is today. After an interview with Adam it was quickly realized the training, hard work, and assistance received from KCEOC has paid off. 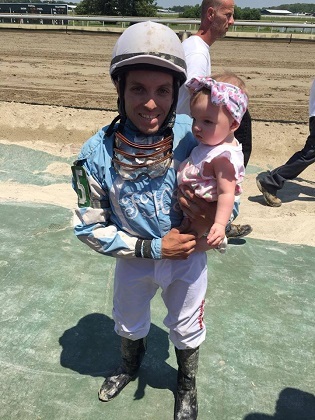 Adam Bowman now lives in Deptford, NJ, with his wife and daughter, and is a professional Jockey. He now rides for Park Race Track in Philadelphia, PA. He has traveled to New York, Delaware, Pennsylvania, Indiana, and Oklahoma to participate in races. Since the beginning of his career Adam has won close to 100 races. Also, the horses he rode have made nearly $2,000,000. KCEOC would like to recognize and congratulate Adam on his hard work, dedication, and success in such a competitive field. Because of KCEOC programs we help individuals make their dreams come true, and Adam is one of many success stories that have resulted from our assistance.